Every roof will sometimes give in to different stresses. It could be due to age, or the environment, or even physical damage by falling debris, but at some point, your roof will require some touch up attention to keep it functioning. One of the main indicators is when the roof starts to leak during rainy days. It can also be indicated by your roof’s inability to handle a particularly nasty storm, especially one with hail and heavy winds. One of the easiest ways to get a grip on such an occurrence is carrying out a re-roof. The name itself is a tad misleading. Re-roofing does not involve taking off your entire roof and starting the entire building process from scratch. That process is called roof replacement. Re-roofing on the other hand, is the process of laying a new set of shingles or panels over an already existing roof, in order to plug any leaks or take care of certain weaknesses that could be forming, before they turn into a major mess that requires a roof replacement. It is however important to note that not all roofs will benefit from a re-roofing. In cases where the roof has undergone extensive damage, including physical wear and rot, it is not advisable to do a re-roofing. It is actually considered rather dangerous, since what you are doing is effectively papering over some pretty serious cracks. The potential for a roof caving in is very real. Take time to evaluate your roof properly before deciding on a re-roof, and preferably enlist the services of a qualified roofing professional. When compared to a roof replacement, this is a relatively cost effective measure to undertake. This is because it takes less material and time to complete, which also means you pay less in terms of labour. Most experts give free quotes, and if you compare re-roofing to some of the maintenance practices available, the cost differences are negligible. It basically costs about the same amount of money to repair, recolour, or fic and existing roof, with the added benefits of lasting longer and being infinitely better in many ways than a simple roof repair. This makes it a viable option for when you need to make some improvements to your roof, but do not have the money to spend on an entire replacement. Over time, many of the components of your roof could become discoloured or lose their shine. This is due to many of factors, including weather changes, assault by strong winds, paintwork peeling off due to heat, or even getting scratched by overstretched tree branches. When this happens, what you need is a re-roofing to bring the beauty back to your roof. Adding new shingles, panels, or sheets to the roof automatically makes it look a lot better, without having to change the entire structure. Re-roofing is one of the easiest ways to achieve that “new roof” look that most people look for, and give your home that appeal that it needs. With a re-roofing, you can change the colour of your shingles to match any changes that might have been made to the paintwork around your home. In fact, in some cases, this is usually the reason some people re-roof, since changing the entire roof would be too expensive. 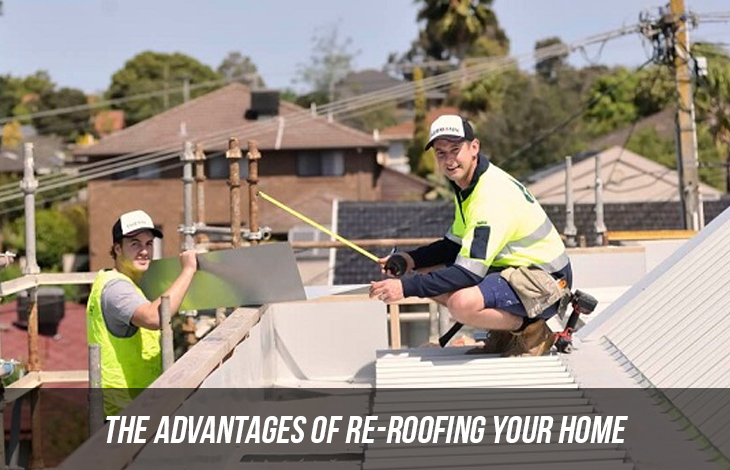 One if the more important benefits of undertaking a re-roofing is the added support. When you add an extra layer of shingles or panels to your roof, it comes with the added advantage of adding strength, support, and an extra protective layer. This means the roof is able to better withstand strong winds, hail, and some of the other weather anomalies that Australia is known for especially during winter. This also has the added advantage of keeping further repairs at bay, since there is an extra layer to weather the brunt before you have to undertake any fixing. Depending on the material however, this added protection differs. It may also necessitate reinforcements in the trussing. Terracotta and ceramic tiles for example are heavier and would require a sturdy frame during the installation. Galvanized steel shingles on the other hand, will offer more protection during storms. Knowing which material best works for your re-roofing needs is therefore important before you undertake one. Re-roofing is relatively easy to install, and the process does not take too much time. This is aided by the fact that you do not have to remove the already existing roof. You are only required to add new shingles to the existing infrastructure, a process that does not take a qualified professional too much time. This means the steps that are taken in traditionally installing a roof are cut down by more than half. Even when you factor in the size of the job at hand, it is still a lot quicker than a complete overhaul, in the case of larger houses.